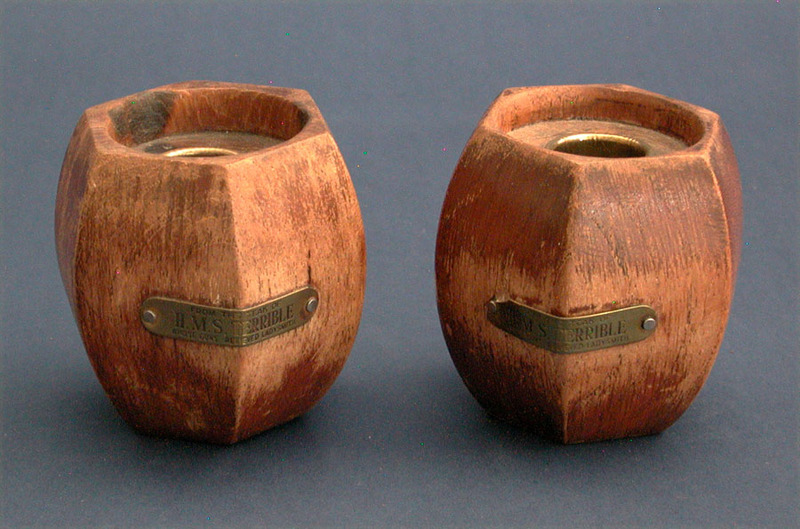 A PAIR OF CANDLESTICKS MADE FROM WOOD SALVAGED FROM H. M. S. TERRIBLE. Solid teak made in the shape of a six-sided barrel. The tops with brass inserts that receive the base a a candle. The front of each affixed with brass plaques that are inscribed "FROM THE TEAK OF/H . M. S. TERRIBLE/WHOSE GUNS RELIEVED LADYSMITH". 3" high x 3" maximum width. Condition good noting that the lacquer finish is worn from the area around the plaques. In 1899 the vessel steamed to South Africa during the second Boer War where she supplied some of her guns for land use which were effective in relieving the British that were holed up at the Siege of Ladysmith.